The return of the fabulously indulgent Not Afternoon Tea offers four unique new plates to truly tease the tastebuds. As before, each dish comprises of a quartet of desserts, specially crafted by Head Pastry Chef Penny Wabbit and her team, which are paired perfectly with a bespoke cocktail created by the OXO Bar team. ‘Rhubarb, Rhubarb, Rhubarb!’ offers a much needed blast of colour during the darker, colder months. A fennel meringue is topped with perfectly poached rhubarb and accompanies a traditional favourite, rhubarb fool. A carefully crafted almond sponge is served with rhubarb parfait, rhubarb jam and sweet Hendricks Gin sorbet. A silky yoghurt and orange pannacotta, wrapped in rhubarb and vanilla jelly and a rhubarb gingerbread cheesecake complete the plate. Partnered with the refreshing combination of Domaine de Canton, two ginger liqueurs and charged with Zeo, “Rhubarbarella” compliments the tart flavours of this fresh and fabulous four-piece. ‘Hot n’ Sticky’ explores the sweet, exotic flavours of partner cocktail Guilty Pleasures, which combines Appleton VX rum with coconut and banana. The ‘hot’ caramalised apple turnover on custard and the creamy Pandan rice pudding & coconut shortbread, with Taywell lemongrass and chilli ice cream, juxtapose beautifully with the ‘sticky’ banana cake, topped with caramelised condensed milk, and the mini Baklava bite. Reinterpreting the much loved chocolate bar, ‘Chocolate Fruit and Nut(case)’ combines naughty and nice with a divine flourless chocolate cake with golden raisins and apricots and a devilish white chocolate and dried cranberry tart. A pyramid of hazelnut and bitter chocolate marquise and the finely formed caramela and macadamia nut truffle are the ideal partners to an espresso martini, with an OXO signature twist. Completing the quartet, The ‘Mad Hatter’s Tea Party’ reinvents the quintessential English brew by subverting flavours and combining contrasting components to create truly unique taste sensations. 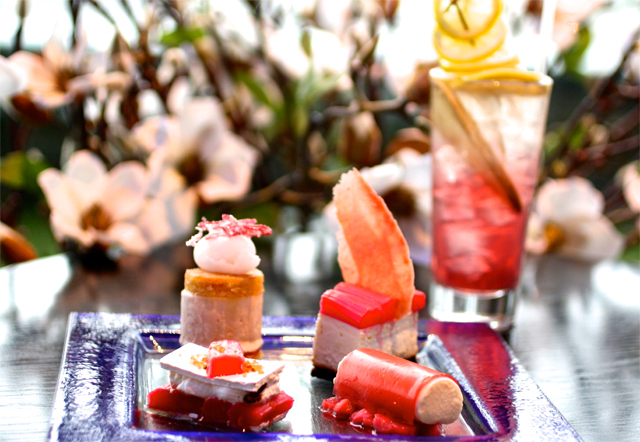 The plate comprises of a smooth coffee mousse with espresso syrup; peppermint tea parfait with milk chocolate feuilletine; green tea frangipane with refreshing Taywell Chai tea ice-cream; four fruit tea pannacotta on berry jelly, with the added extra of an English tea shortbread with white chocolate ganache. The partnered cocktail is a Chambord ‘Drink Me’ tea, enticing the drinker to lose themself in a hot herbal wonderland. Not Afternoon Tea is priced at only £24.50 and is available in the OXO Tower Brasserie from 3pm until 5pm. Please click hereto see the menu. To book, click here or call 020 7803 3888.